Whee! Christmas came and went and now, as far as I'm concerned, we're in the longest week of the year. I have never cared too much for the week between Christmas and New Year's. It just seems to drag and I'm always ready to jump into the new year. For now, I'll share our Christmas with a whole lot of pictures and a few words. Bridget and her boys arrived on the 17th from Oklahoma. Once she arrived, the wheels were in motion for an early Christmas on the 20th for us. 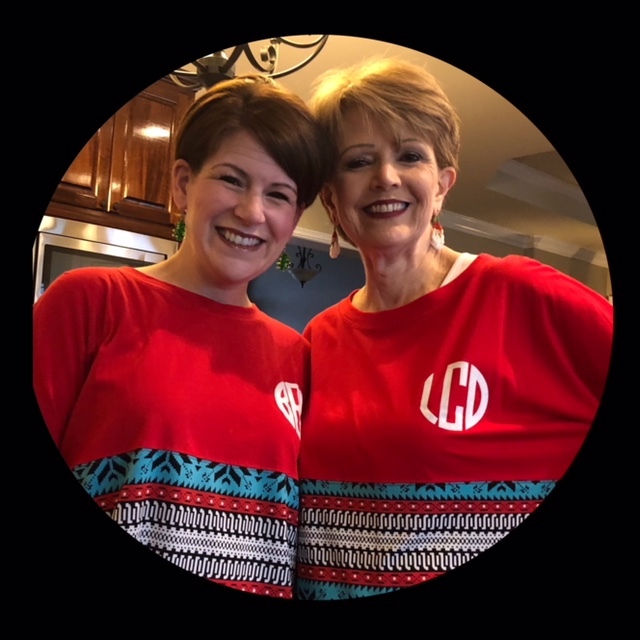 We had matching tee shirts and decided it would be fun to wear them while she was here. We took 3 of the 4 Grans over to see my Daddy. We stayed out in the main area of the facility so the kiddos would have room to move around. 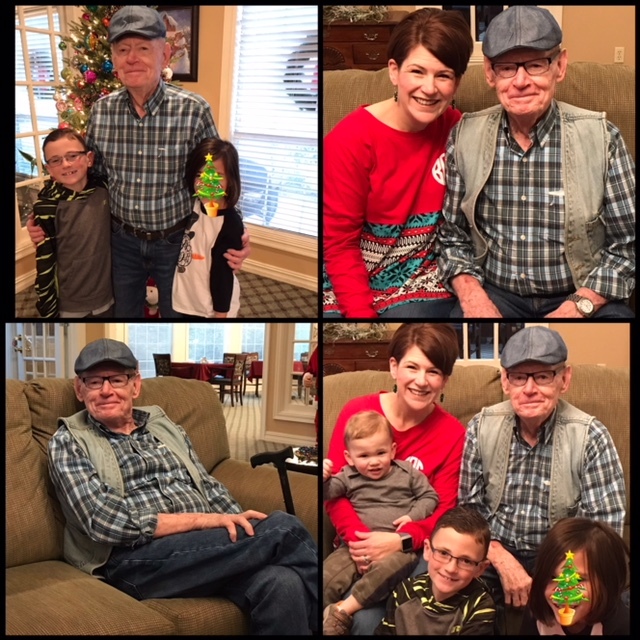 Daddy enjoyed the short visit with his Great Grans. 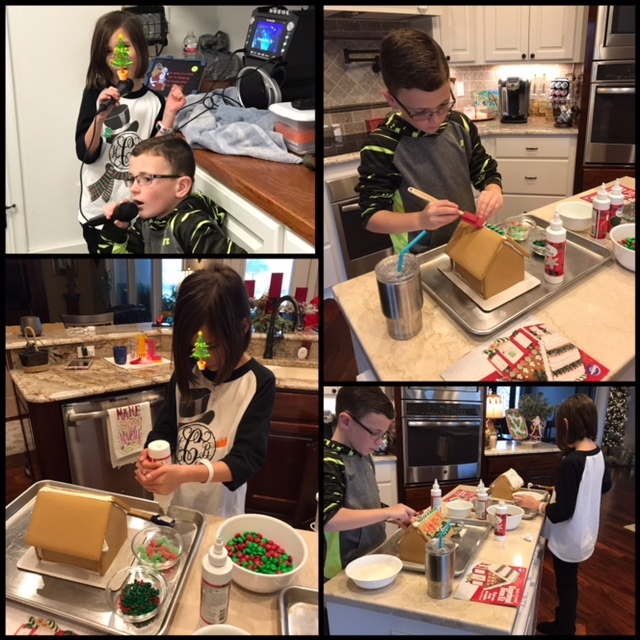 Clancy and Hanna Beth had a good time decorating their Gingerbread houses and playing with the karaoke machine. The weather was rainy and dreary so it was good we had some inside things to keep them occupied. 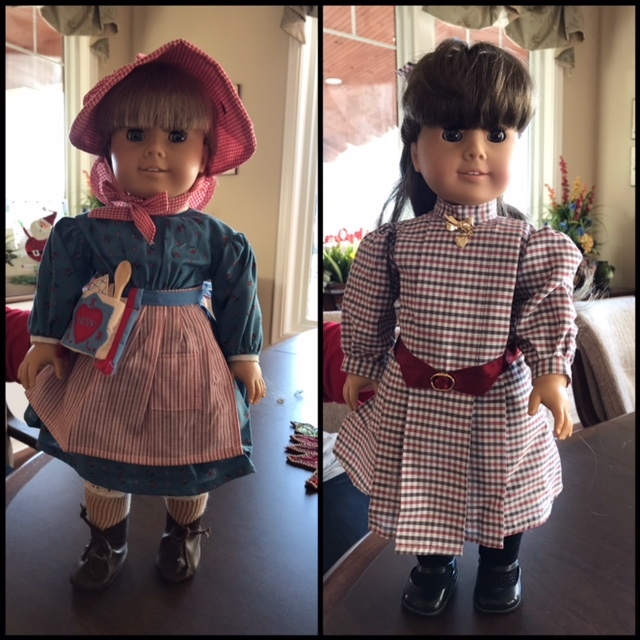 Bridget pulled out her American Dolls that she had gotten 25+ years ago. I have had them carefully stored away. She redid their hair and put them in the dresses they came in. And, here they are, Kristen and Samantha. You can certainly tell that they have been well cared for and she plans to give them to two very special nieces in the near future. And, she's keeping her third one for herself. 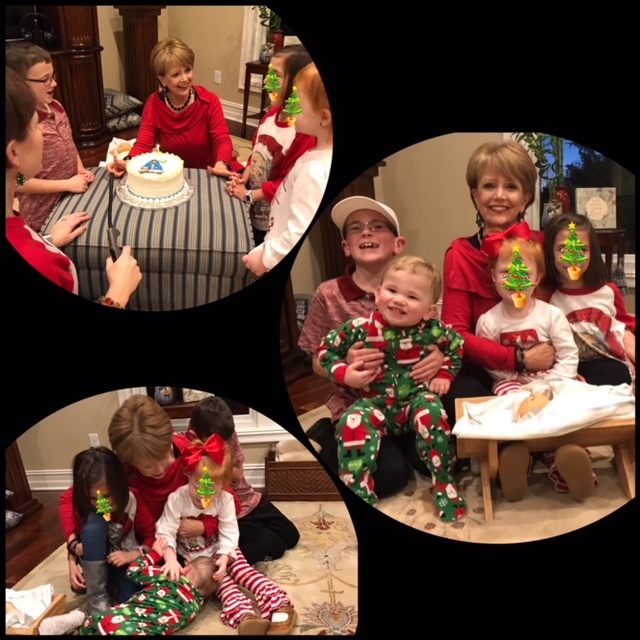 It came time for our family Christmas and we always begin it with a birthday celebration for Jesus. As we were closing out the birthday celebration with prayer, Coleman decided to break loose (see above photo). He took baby Jesus out of the manager, checked him out, then decided to ride the manager like a horse and then thought he'd see if he could lay down in the manager. I'm telling you, this child can give you a "run for your money." It then came time for opening gifts and while I like for it to be done somewhat orderly, that was only somewhat possible with the little ones. But, it was fun and everyone seemed very, very pleased. Bridget and the boys left headed to her inlaws on Friday and then on home on Saturday so they could celebrate Christmas at their house. I was a bit frazzled and exhausted from all the celebration but got it all back together pretty quickly. 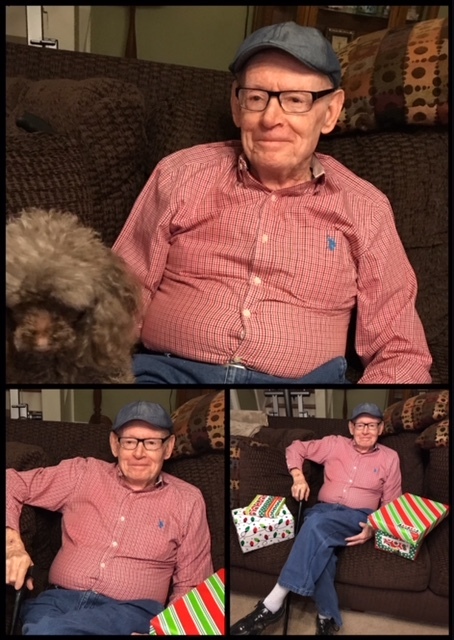 We waited and had Christmas with my Dad on Christmas Eve. It was much quieter then and he enjoyed being at our son and DIL's and playing with Bella, their toy poodle. Brandon and Bridget and their families ready to attend their churches Christmas Eve services. Tommy and I attended the Christmas Eve service with our son and his family. Christmas morning we went over and had breakfast with our son and his family and then we came home, where we remained the rest of the day. And, while it might seem rather "unconventional," I spent the rest of my Christmas day taking down the tree and decor. Yes, I did! 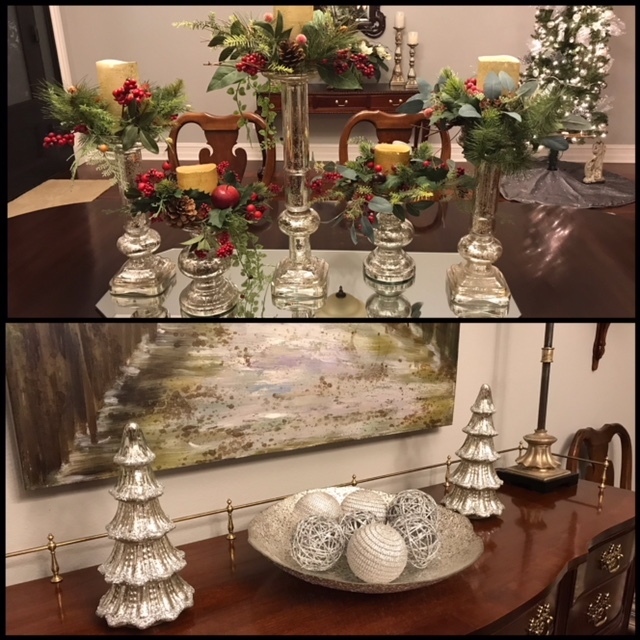 When it's over, it's over and I'm always ready for the decor to be down. So, we got up to a house yesterday morning that looked as though Christmas had never happened . 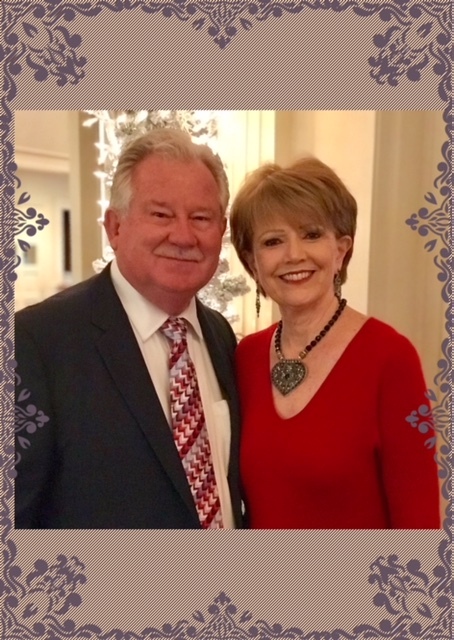 And, Tommy and I went out to breakfast yesterday morning and then headed to the theater to see, "The Greatest Showman." What a great movie!!! The music is awesome, the story is great and the entire production was amazing. Yes, I highly recommend it! And, that pretty much wraps up our Christmas celebration. A lot of family, a lot of love and a lot of memories! 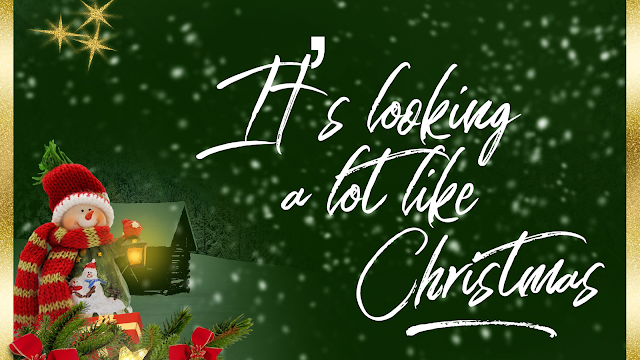 Yes, it's definitely looking a lot like Christmas everywhere we go. 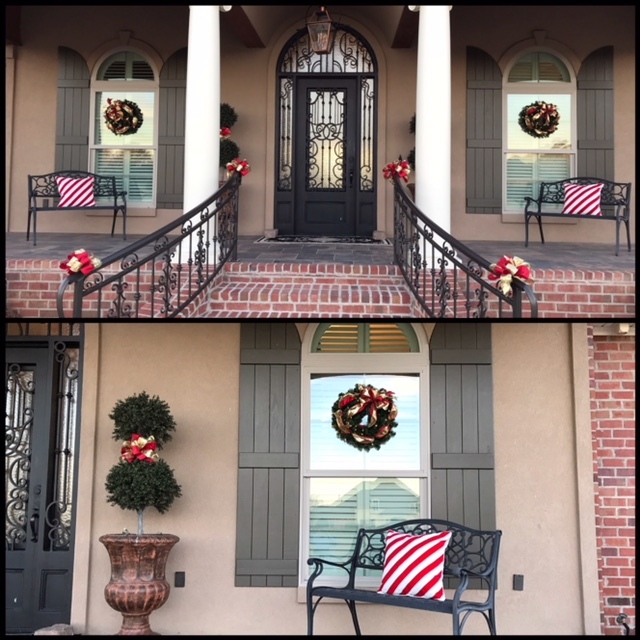 These are some of the absolutely gorgeous decorations gracing our Country Club. It looks like a winter wonderland when you walk in. Perfectly beautiful! 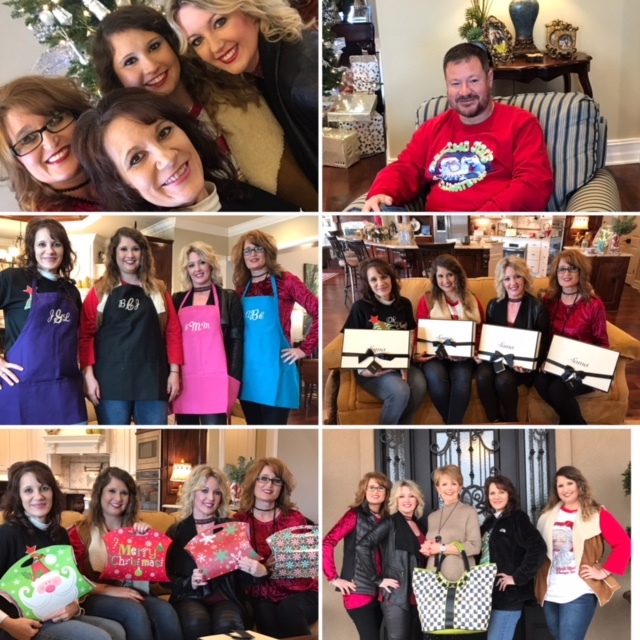 This past Friday at noon I hosted our annual staff Christmas lunch. And, yes, that is straws you see at each plate, I must have a straw and I figure everyone else needs one too. 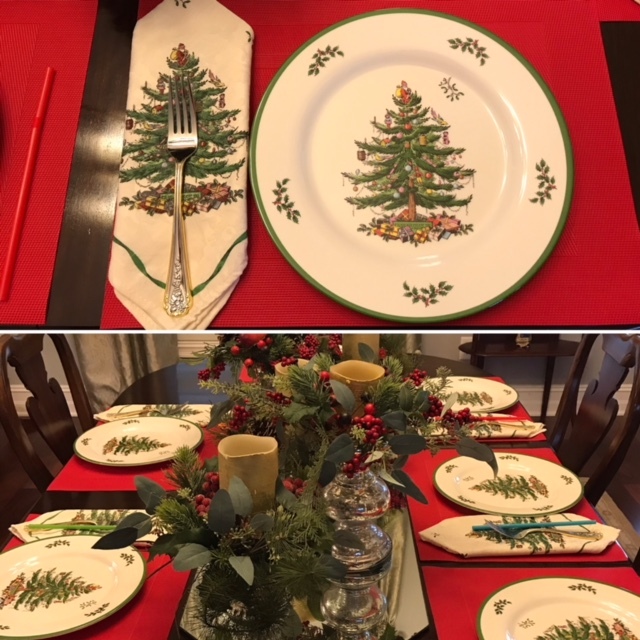 ~proper or not~ I love the Spode Christmas dishes. And, believe it or not, they are melamine! 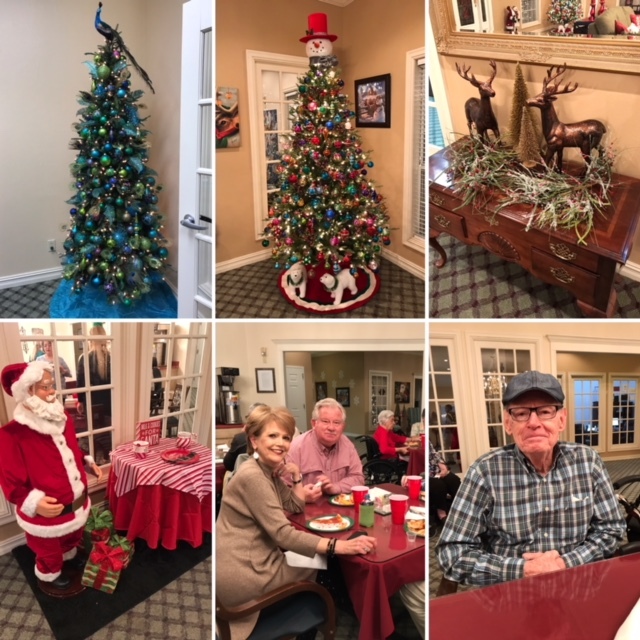 The assisted living facility where my Dad lives had their Christmas gathering this past Friday evening. 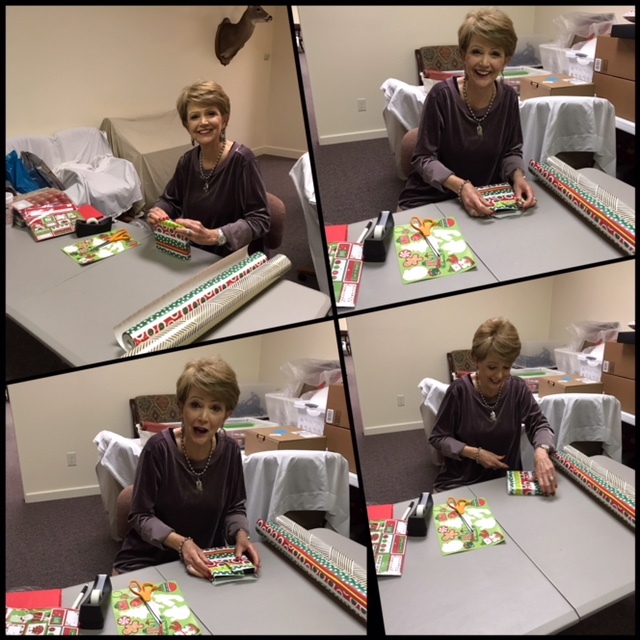 Everything was decorated to the hilt thanks to one dear lady that gives of her time and uses her own decor. The residents and all that come and go enjoy it so much. It's a true labor of love on her part for sure! It has a beautiful Christmas look! And, I've been looking a lot like Christmas too. 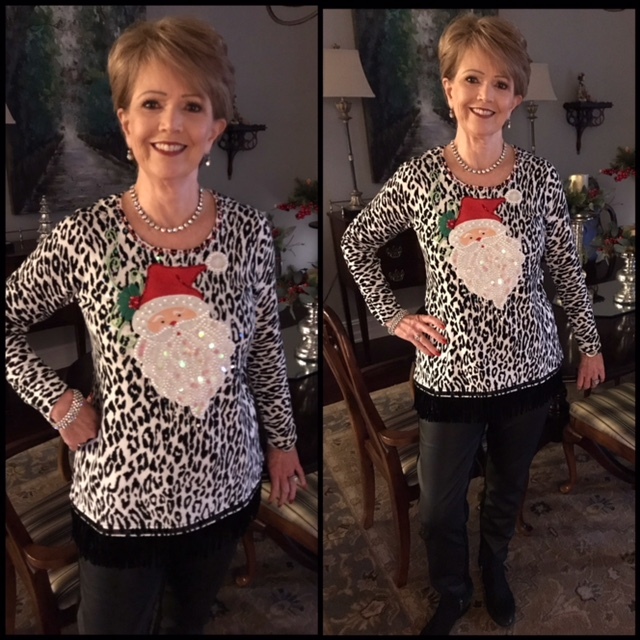 About 4-5 years ago I found these beautiful Christmas sweaters by Berek. They have such a nice and classy look about them and I've enjoyed them so much. The one above is a cardigan. The details on each sweater is amazing and they hold up beautifully. I love this one with the Santa, just so cute and festive. This was the very first one I bought. And, I added this one to my collection this year. I just loved the animal print and the fringe around the bottom (you may not can see it). I'll be checking to see which ones they have left on sale after Christmas as that's when I like to buy them. Half price or less is always a good thing! 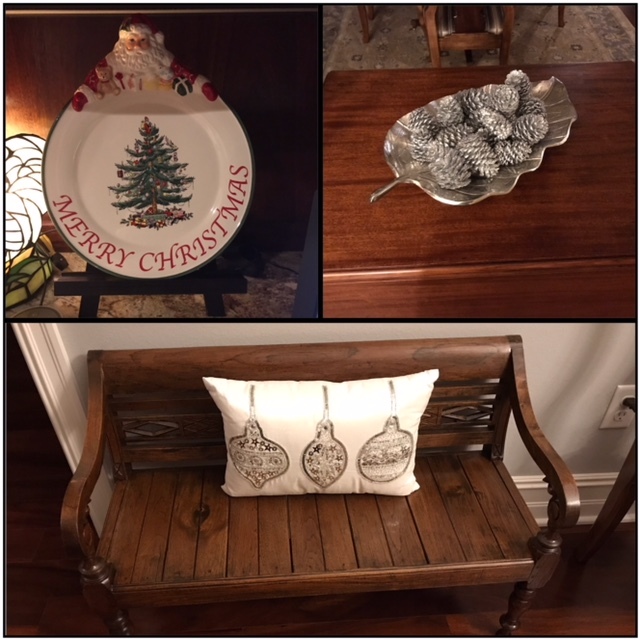 Our Oklahoma family arrived yesterday afternoon so we are in full Christmas mode around here. That means there will be no blogging but a lot of memory making. I'll look forward to sharing some of those memories with you in the days ahead. May you and yours have a wonderful Christmas as we celebrate our dear Savior's birth! 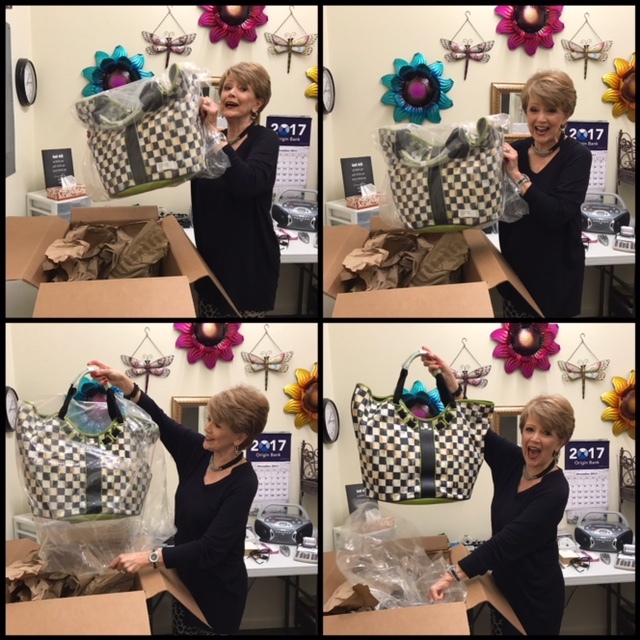 I'm soooo excited about today's post! 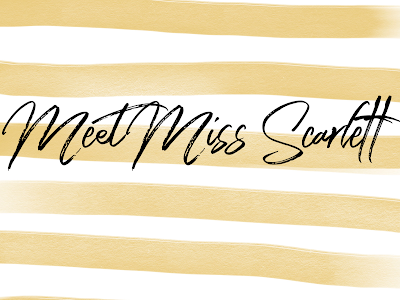 I can hardly wait for you, my blog readers, to meet Miss Scarlett. 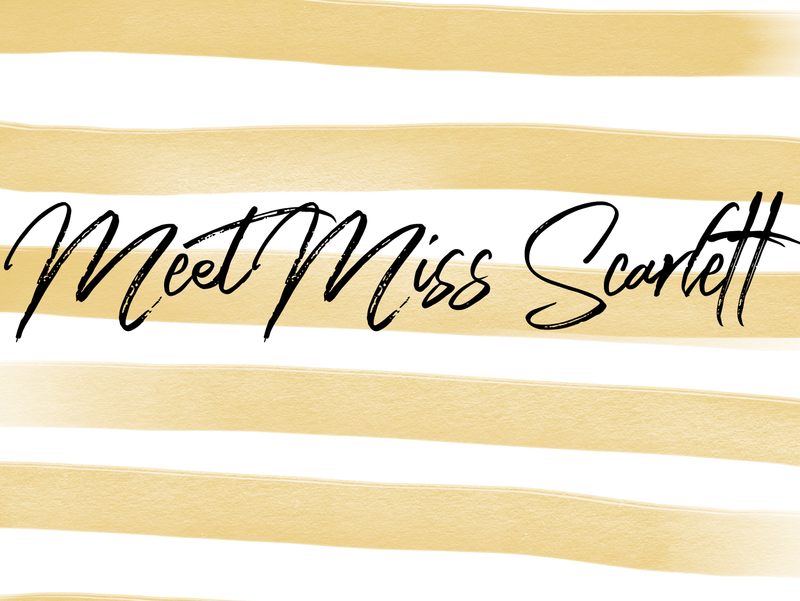 You may be scratching your head and wondering, who in the world is Miss Scarlett. Well, hang on and let me tell you a little pre-story. Over the past few months I have read a couple of different blog posts about ladies and their adventures with their cute McKenzie-Childs totes. I made a comment to one of them that I just might have to get myself a MC tote as they were just so cute. Well, a couple of weeks later I was extended an invitation to join The Traveling Totes gals. What? there's an organized group of 12 ladies that share their adventures with their totes. Yes, there is and I am now an "official" member. 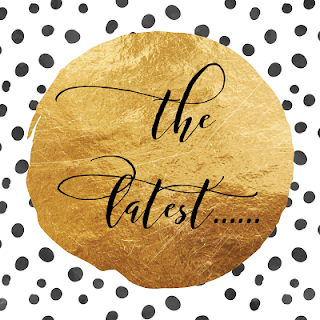 ~see the graphic on my side bar~ I had no idea it was an organized group but what a fun group they are! And, they have been so warm and welcoming to Miss Scarlett and me. 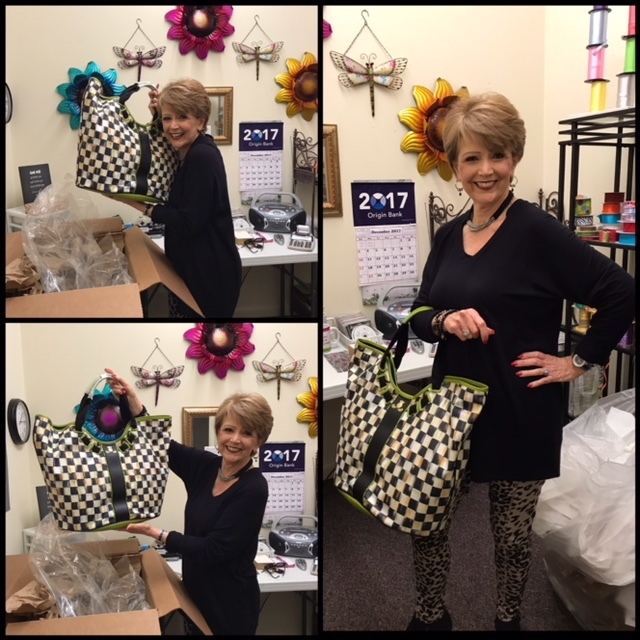 We're from all across the country and will do special traveling totes post every 3 months. My first one to participate in will be next March. Meanwhile, let me get back to introducing you. 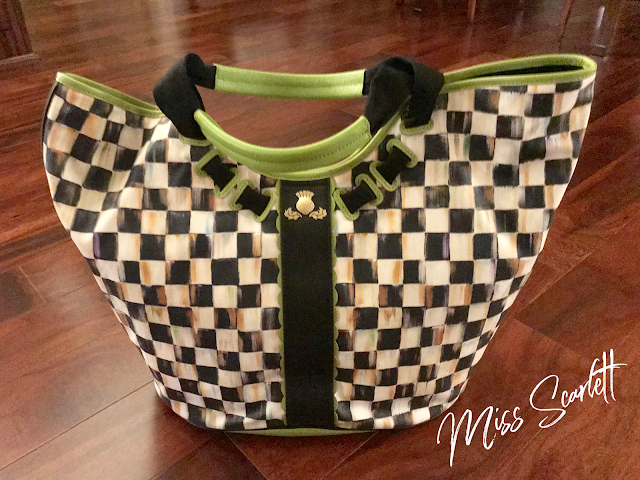 McKenzie-Childs has discontinued the particular tote that all the ladies of the group have but one of the sweet members told me that there was a brand new one available on Ebay. So, off to Ebay I went and bought her. 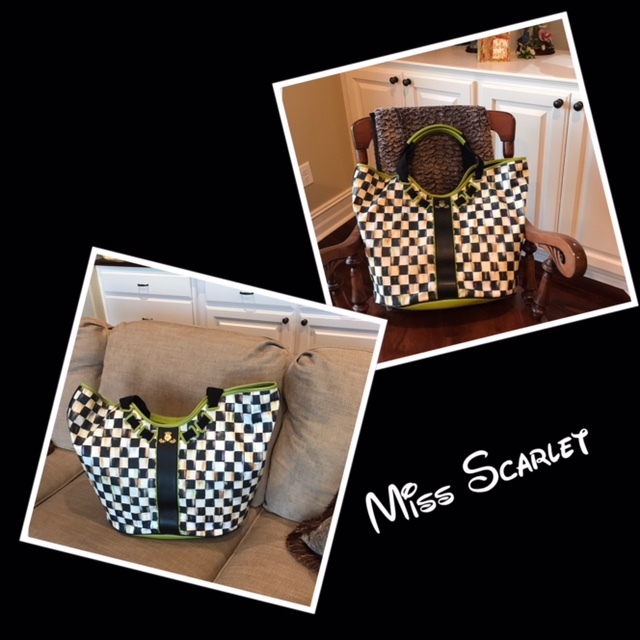 All The Traveling Totes must have a name and I thought that Miss Scarlett was a great southern name and is most fitting for my prissy gal. Miss Scarlett arrived this past Monday is this HUGE box. I had her shipped to my husband's office so I opened her in my little "fun room" there. 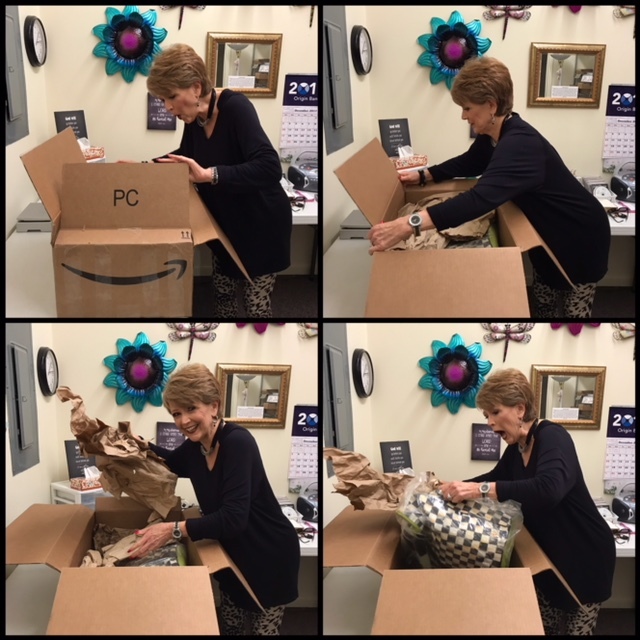 As you can see, I was very "into" opening the box. 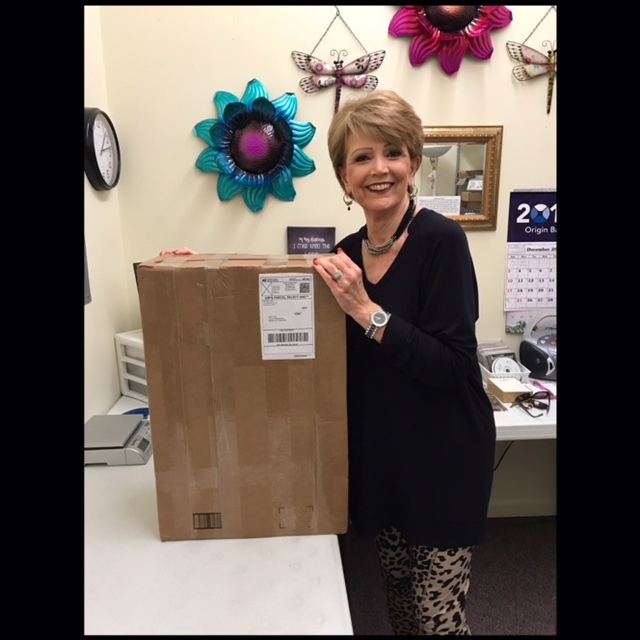 Miss Scarlett was so carefully packed for her shipment, the first of many travels and adventures she would have in the days to come. Finally, I got to Miss Scarlett. She was wrapped tightly in plastic and I finally got it off and here she was "in all her glory!" I gave Miss Scarlett a big ole hug and then put her on my arm to see how good she felt and how good she looked on my arm. Miss Scarlett makes such a statement! 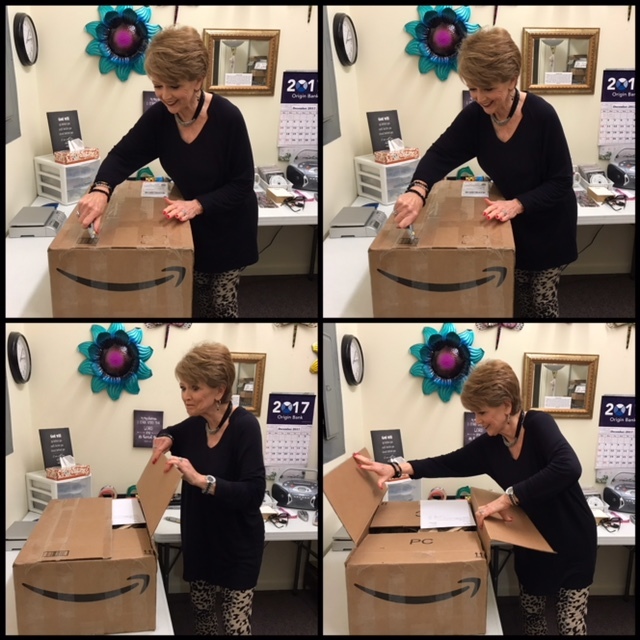 Jonette, one of my husband's staff members, took all the pictures for me and so I allowed her to be the first person, outside of myself, to "give Scarlett a try." I thought she wore her well. It was time for Miss Scarlett and me to head home. She tried out the couch for a while and then I moved her over to the rocking chair and she seemed far more at home there. So, for now, that's where she has stayed while we get acquainted with each other. I'm not sure where Miss Scarlett will be staying when we aren't on an adventure but she has already informed me that it will not be a closet. So, we will work on finding the perfect spot for her in the days ahead and perhaps that spot will not always be the same place. But, Miss Scarlett and I will get it all figured out as we get better acquainted. Thanks for stopping by and making Miss Scarlett feel so welcome and I hope you will enjoy our future outings and adventures. 1. 'Hurry less, worry less'...what's your strategy for making that happen this holiday season? How's it going so far? I can not stand to have to hurry if there's any way around it and I don't like to worry either, but sometimes, I must admit, I do give in to it. 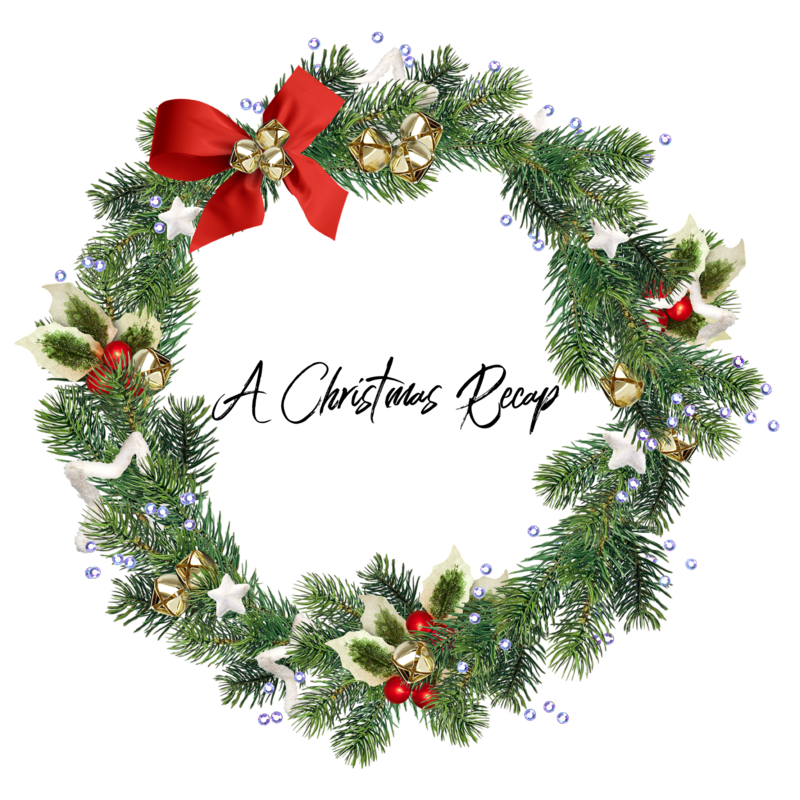 But, I am very prepared and organized going in to the holiday season and haven't had to hurry yet due to my advance preparation. And, as far as the holidays are concerned I can't really think of a thing I'm worried about right now. So, I'd say it's all going very well so far and I'm hopeful it stays that way. 2. Do you have a list of to-dos that accomplishing in order to prepare your home and/or property for the winter season? What are some of the jobs on your list? Are you a do-it-yourselfer or do you hire someone to accomplish these tasks? Here at our new house there's really not much to prepare. We do put a heater in the fountain to keep it from freezing and it has been put in place and Hubby has put insulated faucet covers over the outside faucets. We have heat lamps on our outside hot water heaters and simply have to turn them on if the temps get low enough. ~and that hasn't happened since we lived here~ So, not a very long list for us and we sure are glad. 3. According to dietitians surveyed, the most popular health foods for 2018 will be -turmeric, sprouted foods (bean sprouts, breads with sprouted grains, etc), veggies in place of grains, dairy free milk, and pulses (lentils, chickpeas, etc). What's the first thought that ran through your head when you read this list? Of the foods listed which one might you add to your regular diet? Also, can milk really be dairy free? Is it still milk? My first thought was "this is some very weird stuff." I could definitely add lentils and chickpeas to my diet and I am not a milk drinker in any shape, form or fashion but if I were to, I want whole milk. How can it be dairy free and still be milk? I'm just not sure it can be. 4. The Pantone Color of the Year for 2018 is Ultra Violet. According to the Pantone site 'Ultra Violet communicates originality, ingenuity, and visionary thinking pointing us to the future.' What say you? Do you like the color purple? Did you see the movie or read the book-ha!? Is purple a color you wear often? Describe for us one purple item in your home without using the word purple. If you were in charge of such things what color would you select for 2018? 5. Favorite book read this year? It would definitely be Lysa TerKeurst's Finding I Am. I not only read the book but did the Bible study associated with the book. An awesome book and an awesome study. Let me introduce you to little Rivers. Rivers is the 4th child, and 1st son, of Laura and Zach. Rivers was 5 weeks old yesterday and little Rivers was born totally blind. It has been such a devastating blow to Laura and Zach but I don't know that I've ever known a couple more dedicated to doing whatever they can for this little guy. Laura and Zach take care of most of the maintenance at my husband's office and are a very hard working young couple. They have 3 daughters, 8, 6 and 3 and those little girls are already busy learning Braille. 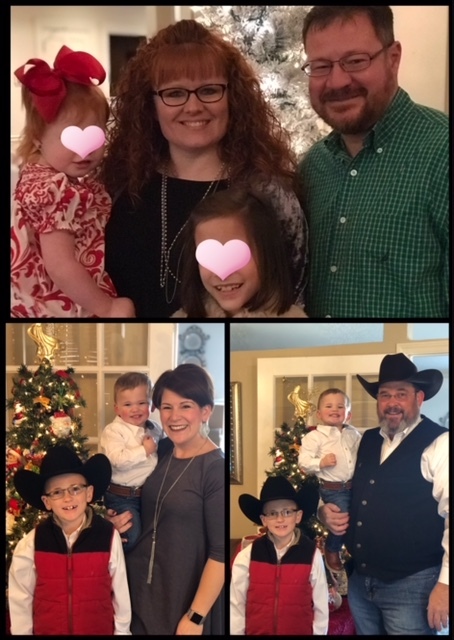 Our Sunday School department adopted this precious family as our Christmas project this year and I'm not sure who has been blessed the most, us or them. It's what this season is all about and we are thrilled to minister to them during this time. 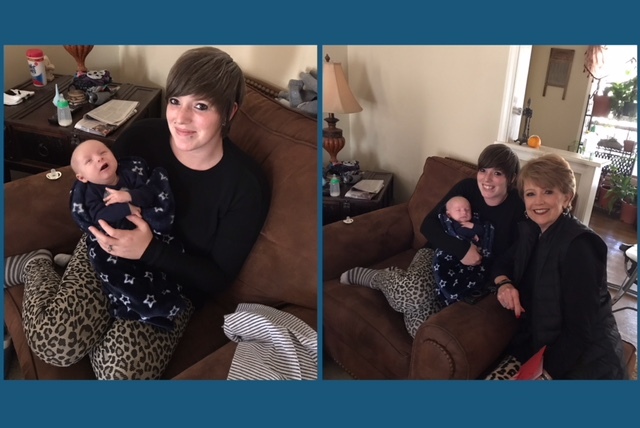 Please join us in praying that before this little fella is grown that there will be advances made in eye transplants and that he would be a candidate. It's Friday folks and I'm not sure where the week has gone, but it has sure flown by. 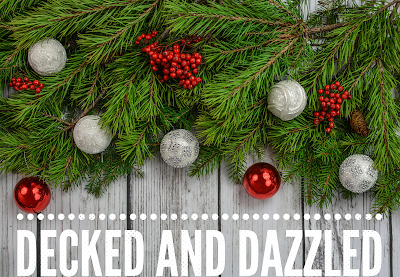 'Tis the season and the holiday buzz is in full swing. 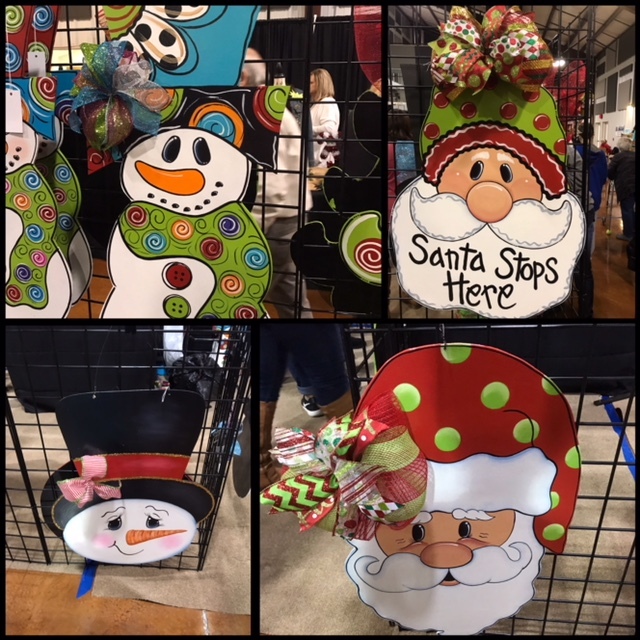 A friend and I went to a great holiday show last weekend. I wish I had somewhere to use all that was there, such as these adorable wood cut outs. There was great looking shabby chic furniture and accessories and while I like it, it is not my style. I did come home with a pretty handmade necklace and earrings and some homemade breads. It was just fun to be there, visit with the vendors and see folks we had not seen in a while. It was the perfect way to kick off the Christmas season. And, I'm happy to report that my presents FINALLY did get wrapped. It really did not take all that long, it was just getting started that took so long. I did have a pain between my shoulder blades afterwards but it was short lived and I'm a happy gal to have this behind me. This Sunday will be a very special day in the life of our family. Our Hanna Beth ~our Princess~ will be baptized during her church's morning worship service. She is a bit nervous and would much prefer to be baptized in private rather than in front of a church full of folks. But, this CiCi's heart will be so full of joy over her decision to accept Christ as her Savior and follow Him in baptism. There is no more important decision she will ever make in her life. 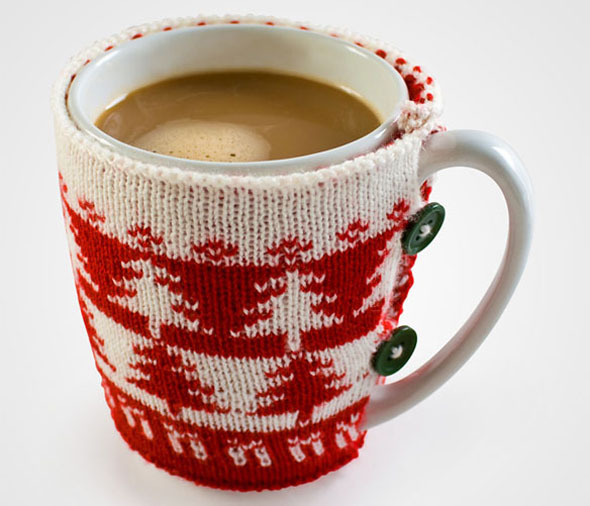 It's time for the Blended Blog questions, holiday style. I really enjoy linking up for this and this one was especially fun. 1. 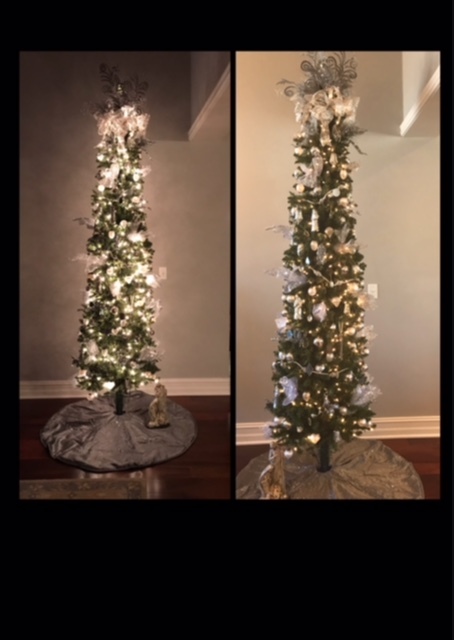 Real or Fake Tree? Well, I like to say I have a faux tree and have for over 25 years. I love them and do not miss having a real one in any way. 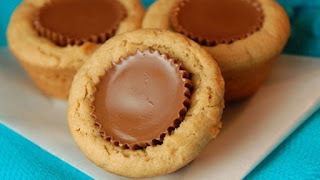 I'm not sure it's considered a Christmas cookie per say, but the Peanut Butter Cup Cookie. They are made with miniature peanut buttter cups. It has been many a year since I've made them, so I may have to give them a whirl this year since we've had this discussion. ~smile~ I mean, what's not to like about peanut butter and chocolate! 3. Home on Christmas Morning or Travel? We are home except we usually go over to our son and DIL's for breakfast and see what Santa left the girlies. After that we are home the remainder of the day. 4. Clear or Colored Lights? It would be clear, just like the stars. 5. Send Christmas Cards? I have always sent Christmas cards but have given thought to stopping. They are expensive and they are soooo time consuming. This year's are done and about to be mailed so I'll decide between now and next year what I'm going to do or not do. 6. Favorite Christmas Present Received? 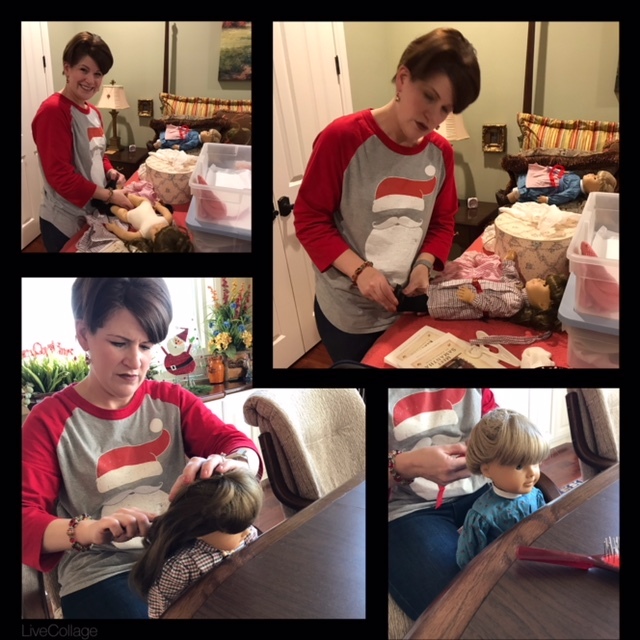 I have received many favorite gifts but the year I got a Chatty Cathy doll stands out as one of my most favorite memories. 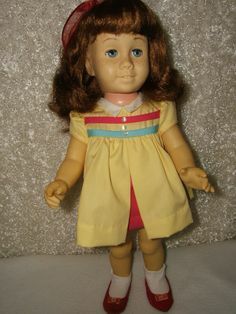 Times were very hard for my parents financially that Christmas, so our next door neighbors gave this doll to me. They did not have any children and loved me and my brother dearly. They made sure that we got what we really wanted for Christmas that year. I'll never forget their kindness. Added note: pictured above is the exact Chatty Cathy that I got and still have to this day. I had her reworked about 10 years ago and she looks so good. I did not have her voice box replaced so she is not "chatty" anymore but she is a real treasure. 8. Stockings or no stockings? I use to make a big production out of stockings but not anymore. I would fill upbig Christmas buckets in lieu of stockings and they were crammed full of all kinds of fun stuff. 10. Favorite Christmas carol? Joy to the World, it's so powerful and I love the words. 11. 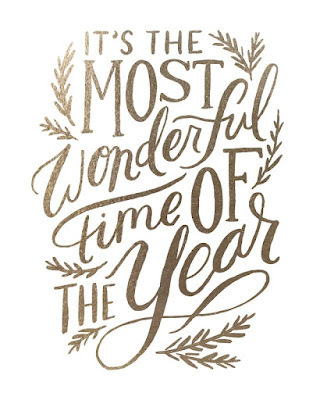 Favorite Holiday Tradition? For pretty much as long as I can remember I have had a birthday party for Jesus.I do it whenever we have our family Christmas which is generally on Christmas Eve. It became even more special once the Grans came along. 13. Favorite Christmas Movie or Show? 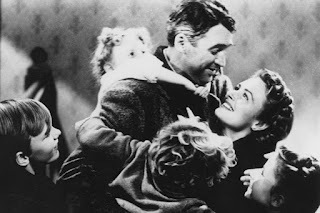 There are a lot of great Christmas movies and shows but the first one to come to my mind was, "It's a Wonderful Life." Holiday or no holiday, it's always coffee for me! Now, I wouldn't mind having a candy cane thrown in for a little peppermint flavoring, but I do love me some coffee! 15. 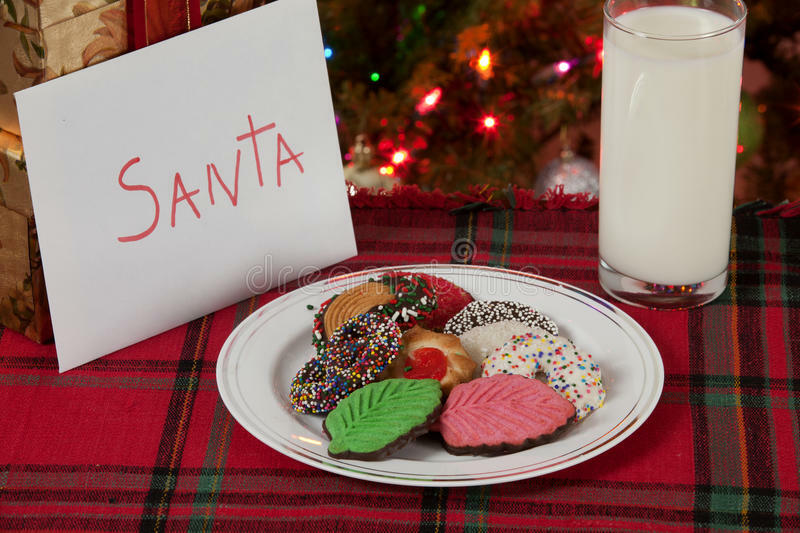 Cookies and Milk for Santa? Wishing you wonderful new week! 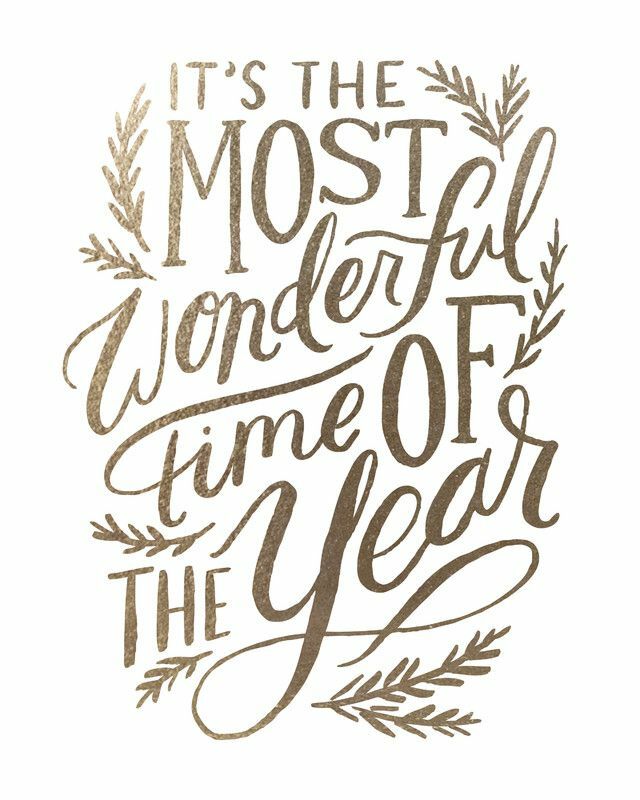 It's December 1st and I loved that we had a week after Thanksgiving before December made it's entrance. I do not like it when Thanksgiving falls in the last week and "bam" it's December two days later. I have managed to get our home "decked and dazzled" this past week and I'm most pleased. As you will be able to tell, it is very, very simply done without much fuzz at all. Just the way I like it at this stage in my life. The wreaths on the windows have battery operated lights and I found the cute striped pillows at Home Goods while we were in Memphis. I love them! With the porch lights on at night it is all very pretty and warm and welcoming. Our tree is in our wide foyer next to the dining room. The picture on the left was taken in a dark room and the one on the right was in daylight. It's decorated with silver and white mercury glass ornaments and truly is very elegant in person. This is the dining table and sideboard. You can see how well the tree goes with the total look of that area. Added note: I love these candle rings from Grandinroad. They have them for all seasons of the year and I think I have them all (5 to each set). And, this is our less formal dining table decor. I absolutely love this beaded runner from Pier 1. I think I now have one of these for each season too. 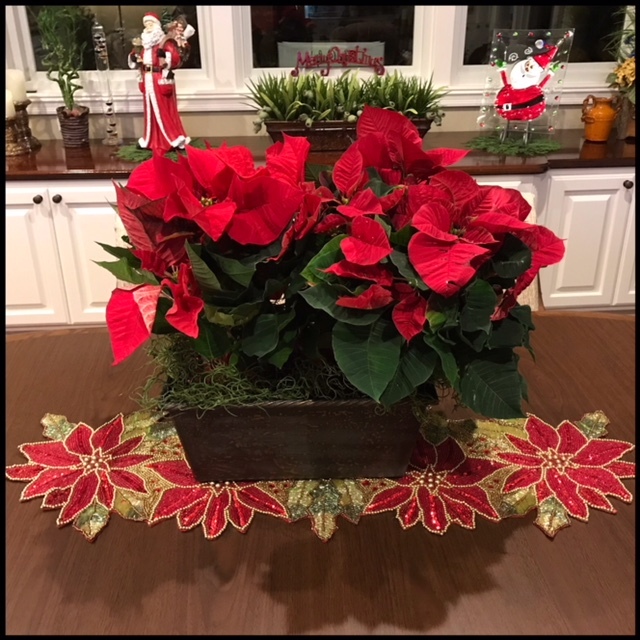 I enjoy having some live poinsettia's and they are the perfect addition to this beautiful runner. 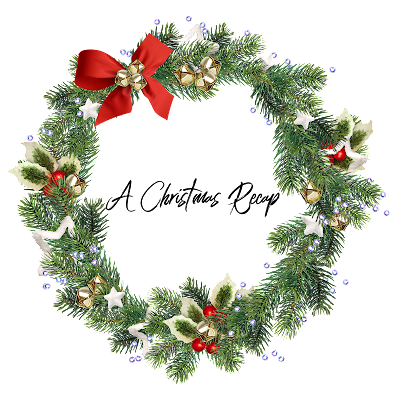 Happy 1st day of December to you and may the days ahead fill your hearts to full and overflowing of "the reason of the season"